Given the cultural habit of towns and cities in the United States for naming their streets for the founding fathers of our nation, it wouldn’t be out of bounds to assume that Duluth’s Jefferson Street was named for Thomas Jefferson. This mistake extended as far as the editors of the Duluth Herald in 1930, an example of how previously well-known facts are erased as time marches on. The fact is that Jefferson Street is named for a local Civil War hero named Ernest R. Jefferson, whose elder brother settled in Duluth in its earliest days. The story of Duluth’s Jefferson brothers is one of equal parts tragedy and overcoming tragedy. Robert Emmett Jefferson, age 21, left his parents’ Ramsey County farm in 1855 to plant himself on Minnesota Point. (Some accounts place the Jefferson family farm in Roseville, within Ramsey County; others place the farm in St. Anthony Falls, Hennepin County, which merged with Minneapolis in the 1880s.) Like so many of those pioneers, his youth was no impediment to his stature in the community: he helped plat Duluth Township and served on its first board of trustees. A year after his arrival, he built the first frame building in Duluth, at 430 South Lake Avenue, now part of the parking lot used to host Grandma’s Marathon celebrations each year. The building served not only as his residence, but was also the only place in town visitors could lay down a bedroll for some time thereafter: essentially, Duluth’s first hotel. (Read more about the Jefferson House here.) In 1859, Jefferson married a woman named Elizabeth, and they had a daughter named Harriet, who was the first child of European descent born in Duluth township. When the Civil War began, Robert likely received word that his two younger brothers, Rufus and Ernest, had volunteered for service. Getting to the war, however, was quite the problem. The Panic of 1857 had, along with most Duluth’s settlers, reduced Robert’s financial circumstances so severely that he couldn’t afford the rather steep stagecoach fare to St. Paul. Thus, he and his wife and small child had to take the arduous 372-mile journey by canoe up the St. Louis and Savannah rivers, then down the Prairie and Tamarac rivers to Sandy Lake, and thence down the Mississippi River. By the time Robert arrived at Fort Snelling, his brothers had already departed as part of the First Minnesota Volunteers. Within a year of his enlistment, Robert had died—like so many Civil War soldiers, he was felled by illness rather than battle wounds. His wife died soon thereafter, leaving Harriet an orphan to be raised by her grandparents. The First Minnesota Volunteer Infantry Regiment, as indicated by its name, was the first body of troops raised in the state. It was part of the Union Army of the Potomac, and saw action in major early battles, including the First Battle of Bull Run (July 21, 1861), and the Battle of Balls Bluff (October 21, 1861). In 1862, they participated in the Peninsula Campaign and the Seven Days Battle near Richmond, Virginia. They also fought at Antietam and suffered significant losses. As he himself climbed back up the slope on horseback, under heavy fire from the attackers, Hancock wondered how he was going to stop or even delay them long enough for a substantial line of defense to be formed on the high ground. Gibbons and Hays “had been ordered up and were coming on the run,” he later explained, “but I saw that in some way five minutes must be gained or we were lost.” Just then the lead regiment of Gibbon’s first brigade came over the crest in a column of fours, and Hancock saw a chance to gain those five minutes, though at a cruel price. “What regiment is this?” He asked the officer at the head of the column moving toward him down the slope. “First Minnesota,” its commander William Colville replied. Hancock nodded. “Colonel, do you see those colors?” As he spoke he pointed at the Alabama flag in the front rank of the charging rebels. Colville said he did. “Then take them,” Hancock told him. Quickly, although scarcely a man among them could have failed to see what was being asked of him, the Minnesotans deployed the slope—eight companies of them, at any rate; three others had been detached as skirmishers, leaving 262 men present for duty—and charging headlong down it, bayonets fixed, struck the center of the gray line. Already in some disorder as a result of their run of nearly a mile over stony ground and against such resistance as Humphreys had managed to offer, the Confederates recoiled briefly, then came on again, yelling fiercely as they concentrated their fire on this one undersized blue regiment. The result was devastating. Colville and all but three of his officers were killed or wounded, together with 215 of his men. A captain brought the 47 survivors back up the ridge, less than one fifth as many as had charged down it. They had not taken the Alabama flag, but they had held on to their own. And they had given Hancock his five minutes. Plus five more for good measure. Ernest was one of the casualties suffered in this suicidal charge, losing a leg but managing to survive. After a long recovery, he was mustered out on December 9, 1863. In 1869, perhaps following the dreams of his dead older brother, he found his way to Duluth, at which time it is said he drove the first herd of cows to the Head of the Lakes. He promptly opened a harness shop and went on to become a bit of a local institution, working as a lighthouse keeper and serving on the Duluth City Council and the St. Louis County Board of Commissioners. By Christmas of 1880, Ernest and his wife Addie had four children: seven-year old Grace, five-year old Robert Emmett, four-year old Annie, and newborn Blanche, who died at age 16 from consumption (tuberculosis). They lived on land that eventually was bought by the Y.M.C.A. 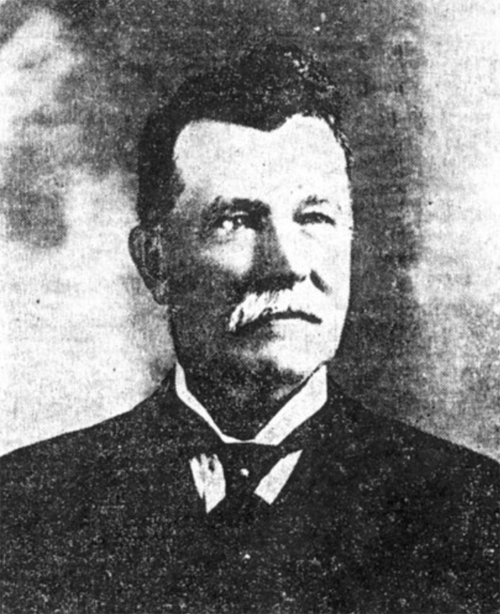 In his later years, the family split their time between the Melrose Hotel and property on Bay Lake, where he died on May 16, 1911 at age 65. He is buried at Forest Hill Cemetery with the Odd Fellows.